Skye Fargo had been following the women for nearly two days, trying to decide if they were crazy, drunk or just hog stupid. That is the first line from the book. 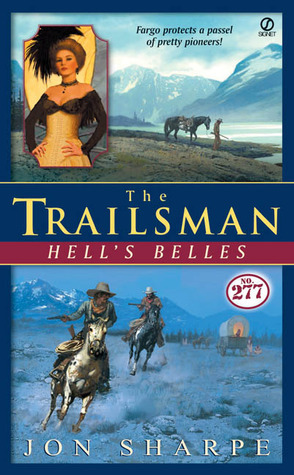 It turns out there are five woman traveling alone in the Seven Devils Mountains by the Snake River. Their guide had been killed days before by a rattlesnake bite. Finally when Fargo makes his presence know, while they were skinny dipping in the river, he finds out why they are there. Mattie, who is the leader of the group, is bringing them westward to be mail order brides to some well-off men in Chandlerville. The trouble is, Fargo knows the town does not exist and as hard as he tries, Mattie refuses to believe him. The area is being terrorized by a gang of bandits who murder prospectors in their sleep, and the Nez Perce tribe is ready to go to war against the Whites invading their area. What could go wrong for Fargo? The series is written with the male reader in mind but this book goes way over the top. No group of promised woman would act this way or not be offended by the men's talk, in any age. The dialogue was just plain dumb throughout. Most of the books in the series are fun brainless reads. I would recommend to pass on this one, though.